Whats New-February 08, 2017 | iMobile Inc.
Family, Friends, and Acquaintances....Connect Only with People to whom You Invite. It Makes Your SNS Life More Secure and Enjoyable! 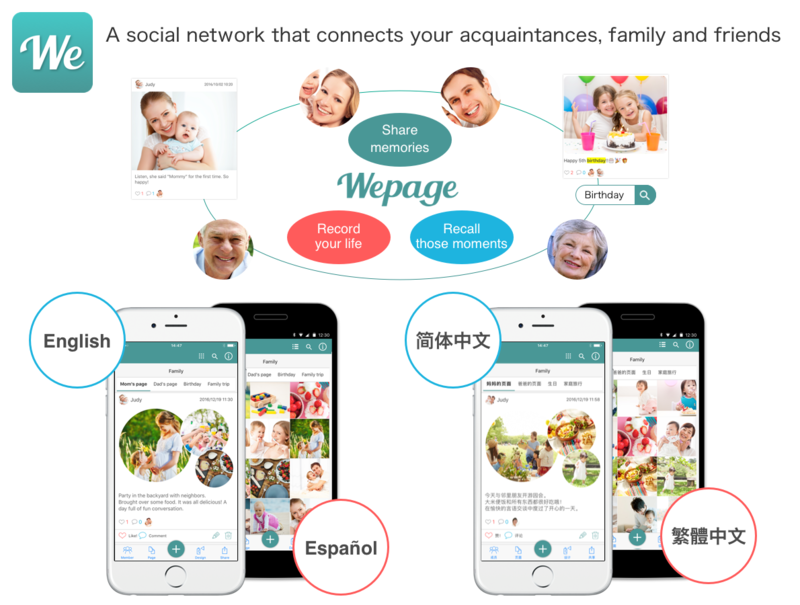 Tokyo, February 8, 2017: iMobile Inc. is pleased to announce the release of the English, Chinese, and Spanish versions of 'Wepage', a new SNS from Japan. 'Wepage' is an invitation-only social networking service created by iMobile Inc., a company which specializes in producing and operating websites for small and medium-sized enterprises. Since the Japanese version of 'Wepage' was launched on October 1, 2016, it has very quickly gained popularity as a "privacy controlled SNS", and within a month of the launch of its multilingualized Android version in December, users in over 50 countries have appreciated this new SNS. As a distribution for iPhone has already started, iMobile Inc. is promoting 'Wepage' further to increase users. Introducing a members-only service for companies is also on its planning list. It has been a while since SNS became a part of people's daily life. However, more and more people are feeling tired of getting unnecessary information or updates from people they hardly know via SNSs like Facebook or Twitter. According to a research by Pew Research Center, 61% of Facebook users take a break from using it for a period of several weeks or more (http://www.pewinternet.org/2013/02/05/coming-and-going-on-facebook/). As a result, more people use either Snapchat, a short-lived messaging service, or the anonymous SNS Whisper, or other messaging apps. The birth of 'Wepage' in Japan is no coincidence, as 'invitation-only' or anonymous SNSs were introduced and developed almost at the same time as Facebook in Japan. Using know-hows obtained by its long-standing IT service business, iMobile Inc. created a new private SNS for sharing a variety of information all at once. And now, 'Wepage' has been launched off into the world! Except for the people you invite such as your family and close friends, no one can see your posts, so you can post your private content safely and securely. You can create posts easily by combining various content such as texts, photos, videos, maps and links. The search function lets you find posts based on when, where, and who you were with. You can easily recall your previous posts. As long as you share the URL and a secret password, you can use 'Wepage' on your computer. "You don't have to get the posts from your friend's friends like other SNSs. You can enjoy this more privately"
"I travel a lot. With Wepage, I can post not only pictures but the maps together. I found this feature very convenient"
"I share the photos with my parents who are excited to see the pictures of their grandchildren. The operation of Wepage seems to be easy for aged people, which is very good"
"Best format to keep my diary secretly updated!" About iMobile Inc.: Founded in 2000, in Tokyo, Japan, iMobile Inc. specializes in information providing services, including information system planning and operation management support. iMobile Inc. also develops and sells computer softwares. Partners include Canon System & support Inc. and SoftBank Group Corp.